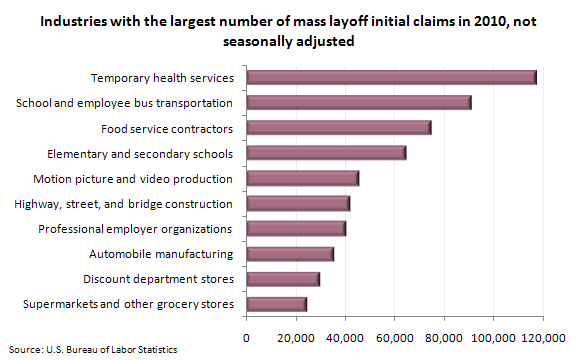 When there’s a mass lay off, it affects not only individuals, but also an entire community. When a company shuts down and scads of people are out of work, that means that few people in the community have extra funds to support each other. Not only funds, but also other kinds of resources as well. Recruiters may be able to sense when the communities that they work with are particularly hard hit. They may find many job seekers with similar job qualifications competing for the same jobs and increased job applications. 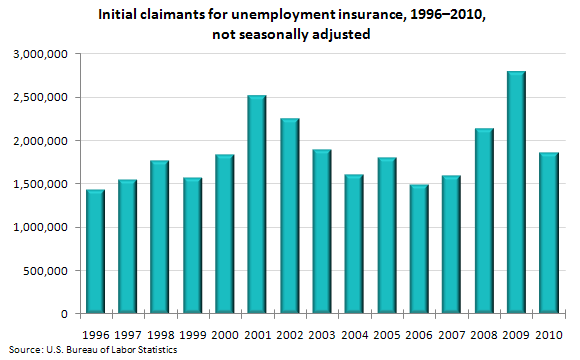 The Bureau of Labor Statistics reports that in 2010, the total numbers of mass layoff events, at 19,564, and initial claims for unemployment insurance benefits, at 1,854,596. These figures are lower than in 2009 when totals reached their highest annual levels on record. It’s a step in the right direction. Take a look to see who was most affected by mass layoffs. You may be interested to see that the industry with the greatest number of initial claims in 2010 was temporary health services. School bus and employee transportation workers and drivers also suffered from mass layoffs. It seems that these areas in which mass layoffs are particularly rampant are areas that affect the daily lives of many. Not to mention, the earth. If all those bus drivers are laid off, that means a lot more people are emitting carbon dioxide into the earth’s atmosphere in order to go to work or school.